The neighborhood of artists, hippies and roaming peacocks is in the throes of a culinary renaissance. Who better to lead us on a tasting tour than the ultimate foodie local? Known for being a quaint respite in the middle of a bustling city, Coconut Grove has been charming locals and visitors with its laid-back vibe, sidewalk cafes and boutiques for decades. As a newer resident of the nearby neighborhood, I’ve enjoyed exploring its bountiful dining options in recent years. And although the entire area is embarking on a significant revitalization, the longtime classic joints continue melding with new hot spots to create a truly robust culinary scene. Here is a sampling of some of my go-to places for the perfect Grove meal. 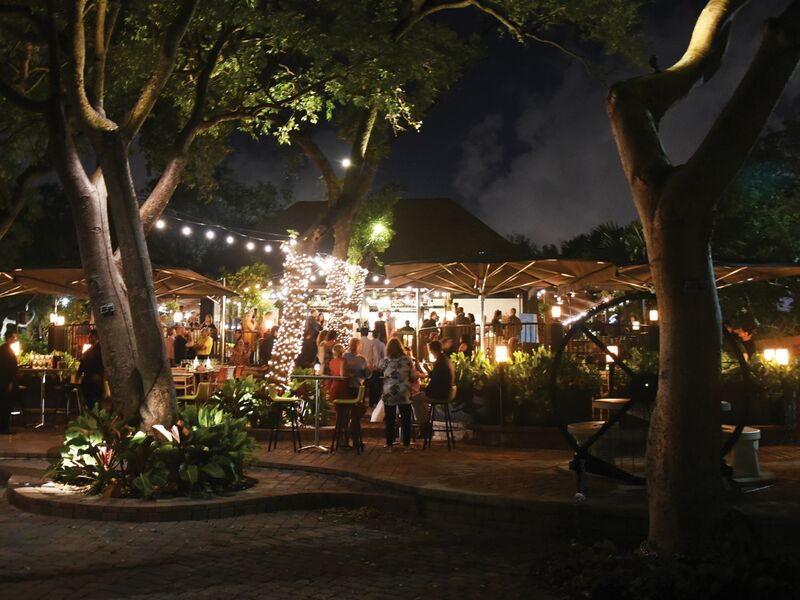 With its twinkling lights, salty bay breeze and lush foliage, the patio at Glass & Vine feels like a fairy tale amid the backdrop of Peacock Park. The menu is also full of enchanted offerings—watermelon salad with toasted corn, beef short ribs with housemade Worcestershire and hollandaise, sweet potato tater tots—all dreamed up by beloved chef Giorgio Rapicavoli. This indoor/outdoor hot spot is aptly designed for any occasion, whether it’s date night or any given happier hour of the week, and a menu full of chef-driven innovations to keep everyone in the party happy. This completely unassuming newcomer to the Grove prides itself in serving modern takes on traditional Spanish tapas. The menu revolves around several quality protein offerings that have been kicked up a few notches (gochujang-glazed octopus or steak tartare with miso-cured egg yolk emulsion), plus unique offerings like roasted beets with smoked sour cream and salmon roe to further pique your interest. Diners shouldn’t be afraid to ask for guidance with the 100 percent Spanish wine list while they sit back and enjoy this simply elegant neighborhood gem. James Beard Award-winning chef Michael Schwartz’s high-quality ingredient-driven approach to pizza is a culinary oasis nestled across from the transformative Coco Walk in the heart of town. While partial to perfectly done classics like the margherita, more unique combinations like rock shrimp with lemon and manchego or slow-roasted pork with fig and fontina are equally palate-pleasing choices. Plus, you can top off the dining experience with signature dishes like the expertly done roasted chicken and crispy polenta fries that are also available here. This indoor/outdoor oasis packs a powerful punch when it comes to serving new American cuisine. Chef Michael Beltran’s contemporary approach reimagines ingredient-driven combinations: radishes prepared with nori and trout roe butter, smoked head cheese croquettes, swordfish milanese, or the smoked pork chop with squash and farro. Seasonal offerings like the grilled peach salad serve as the perfect light and bright pairing to Ariete’s indulgent baked goods, including the classic Parker House rolls and creative pastelitos. While its not-so-secret cacio e pepe served out of a wheel of cheese is worth every bit of the Instagram fame it’s received, the impeccable seafood preparations at Sapore di Mare are rich with authenticity that make for a truly indulgent experience here. It is, for all intents and purposes, a relaxed neighborhood joint where owner Veronica Paderni can often be found at the hostess stand ensuring that every guest has a special experience. The bustling kitchen is serving zucchini flowers, veal milanese and, my personal favorite, lemon cake that is unexpectedly light and leaves your taste buds in a state of la dolce vita. I’ve been coming here for years, even before I moved to the area, to relish in the exceptionally prepared dishes and welcoming atmosphere. Classics like the chicken tikka masala, butter chicken and tandoori lamb chops are accented by paneer preparations bursting with flavor and a balance of spices that is nothing short of masterful. The cozy dining room is anchored by an inviting and comfortable bar area, also making it a top choice for solo dining.